This is the world's largest insect. The giant weta is a cricket-like creature with a wingspan of close to seven inches. 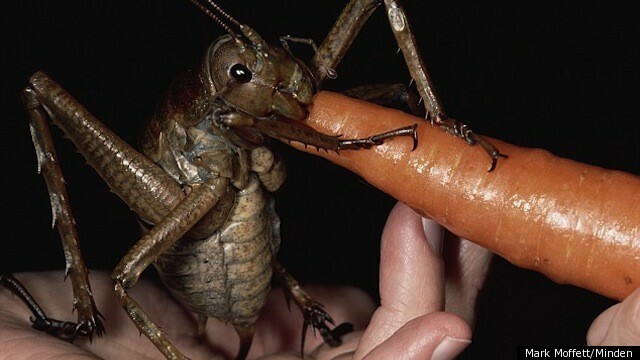 The one in the picture (full image below), isn't just the largest weta, it's the world's largest insect ever photographed. Renowned entomologist Mark Moffett found the amazing bug after two days of searching New Zealand's Little Barrier Island. The species was previously found on the New Zealand mainland, but had been virtually annihilated by rats introduced by Europeans. Moffett, 53, located the weta in a tree and proceeded to feed her a carrot. "She enjoyed the carrot so much she seemed to ignore the fact she was resting on our hands and carried on munching away," Moffett said in a press release. "She would have finished the carrot very quickly, but this is an extremely endangered species and we didn't want to risk indigestion." Moffett, who said the creature weighed about as much as three mice, quickly let go after the photos were taken.